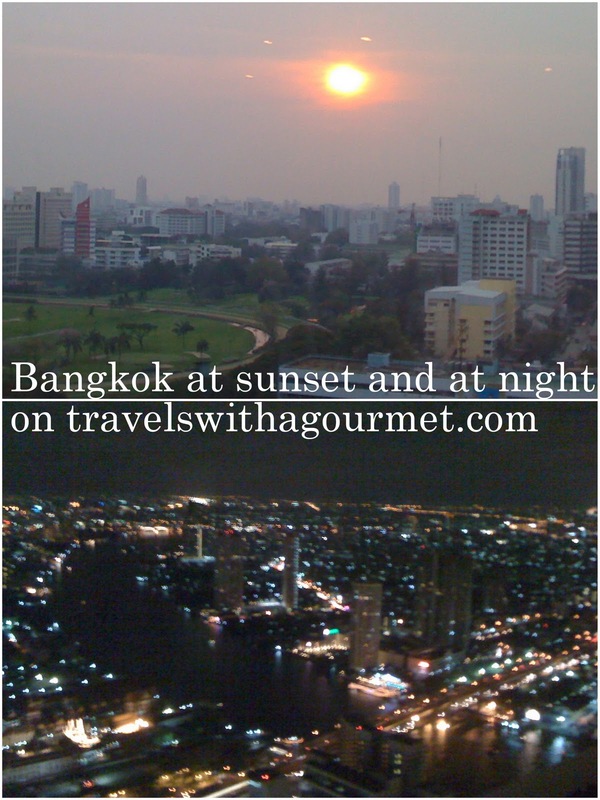 Bangkok is a large sprawling city with the old town close to the Chao Phraya river and the new business district further away from the river and in the center of the city. A friend and I decided to go on a shopping expedition and armed just with the Bangkok LUXE guide, comfortable shoes and a bottle of water, M and I set off right after breakfast and took the Skytrain to the riverside station at Saphan Taksin. We deviated from the shopping route in our guide and started off by the river instead of by the Oriental hotel and worked our way through several of Bangkok’s backstreets before we finally made it to the river. The hot and humid walk gave us a taste of the real Bangkok as opposed to the sanitized streets near our hotel. 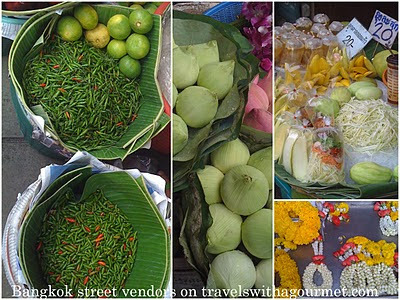 There were many sights, sounds and smells – from street vendors hawking fruit and flowers, to tiny street side restaurants with just a few plastic chairs and tables alongside a large wok and one person cooking everything to order – smoky meat on the grill or stir-fried spicy noodles. After several stops to ask for directions, we ended up twisting and turning through the tiny backstreets then started to see many boutiques lined up one after another on the busy main road. We started to stop and look in several boutiques and ended up purchasing quite a few things. Worth a look are the exotic leather goods made of stingray, python, crocodile, alligator and ostrich from a tiny place with the not-so-original name of Thailand Shoes Shop (great for ballet flats, loafers and flat sandals) and it’s sister store further up the road for bags and wallets called Phoenix Shop. We couldn’t walk out without ordering a couple of sandals each in alligator and python. For flatware and one-of-a-kind hammered metal objects (vases, pitchers, trays, buckets), we stopped at Maison des Arts where I went back a few days later to buy a whole set of horn-handled flatware for a very reasonable price. There were also beautiful sculptural pieces – large curved bowls and huge wine and champagne buckets. A few doors up was a tiny store with an attractive window display of linen clothing and small accessories – From Siam with Love. Next up was a large storefront with displays of tailor-made dresses at World Group (Chanel style wool boucle jackets and dresses plus men’s suits and shirts), where I also returned a few days later to order a shirt dress for myself and several bespoke shirts for A which were delivered to our hotel in less than 24 hours. Finally turning into Soi Charoenkrung 40, which dead ends into the river, many more shops lined the road and we made several stops. There are two that are worth more than a quick look – Lin Oriental Gems where we found fantastic sterling silver designs copied from Hermes and Tiffany and Thai Home Industries which is housed in an old wooden Thai house stocked from floor to ceiling with an interesting mess of antique baskets (not for sale) and all sorts of interesting finds made in Thailand – horn napkin rings, Thai painted ceramic teapots with brass handles, brass and metal bowls, brass and metal flatware and a selection of multi-colored Thai cotton pajamas. 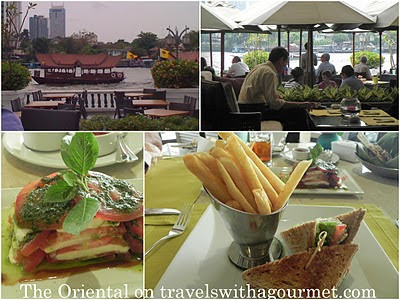 We finally reached our original destination, the Oriental (actually a Mandarin Oriental hotel) where we met S for a very late lunch on the large deck of the Verandah restaurant overlooking the busy Chao Phraya. After our leisurely meal, it was already rush hour and as we didn’t want to get stuck in a typical Bangkok traffic jam, we walked back up the road and stopped by the State Tower building to go up to The Dome on the 63rd floor and have a glass of wine at Distil‘s outdoor terrace overlooking the lights of Bangkok. In the week I spent in Bangkok, I returned to that area of small streets off Chareonkrung road once more for shopping and exploring and finished off the morning again at the Veranda for lunch. It’s a super shopping itinerary which could either start or end at the Oriental hotel which makes the bargain-hunting worth it. Me too. It was fun!